Mitsubishi Electric has been developing and manufacturing uninterruptible power supply (UPS) components and systems for more than three decades. That experience, and the continuous application of new power-device technologies to further improve products in the industry clearly explain why Mitsubishi Electric has dominated a large portion of the world UPS market for years. When purchasing a UPS system, the key word is “dependability.” And there’s one company that many rely on, Uninterruptible Power Supply systems by Mitsubishi Electric. The items listed below are just a small sample of the products available from Mitsubishi. 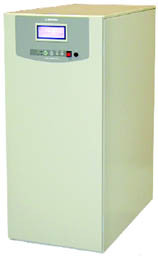 For more information on these units, please call us at (888) 678-7877. The 2033C and 2033A use Insulated Gate Bipolar Transistors (IGBTs) in both the recifier and inverter sections. 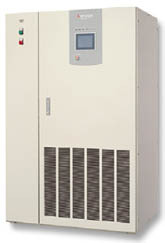 These UPS's were designed with the whole electrical system in mind. This advanced technology provides the best input and output performance available in the industry. The 6kHz Digital Signal Process (DSP) logic will supply your non-linear loads with high resolution output, capable of 200 adjustments each cycle. The IGBT rectifier will minimize the upstream effects by limiting the current distortion to less than 6without using a filter. The design will allow you to aggressively size your emergency generator 1:1.